The The Apollo Project is a global cross-sector initiative for businesses and organisations of all sizes, which provides the practical tools needed to better embed more inclusive workplace practices and cultures to promote meritocracy. The Apollo Project seeks out and awards ground-breaking initiatives and examples of best practice backed up by evidence, and then offers these as “open source” resources for other organisations to adapt and implement. The Apollo Project is now in its fourth year. This year individual awards have been added in order to recognise individual change-makers who act as catalysts for change as well as organisations. The Apollo Project is an initiative of the InterLaw Diversity Forum, inspired by the recommendations of its 2012 study, Career Progression in the Legal Sector, which identified the need to effect cultural change in order to ‘level the playing field’ and create more meritocratic workplaces. The Apollo Project helps create these meritocratic workplaces by leveraging on the examples of best practice to give organisations from all sectors practical tools to help make effective cultural changes. The Apollo Project, in partnership with the Financial Times, runs an annual competition which seeks out the initiatives and examples of best practice that are driving cultural change. Winning initiatives have provided evidence of measurable outputs, and can be replicated or adapted by other organisations looking for guidance in this area. All winning initiatives are freely available on the Apollo Project website, thus enabling other organisations to shape and inform their work on diversity and inclusion, talent management, and organisational change. 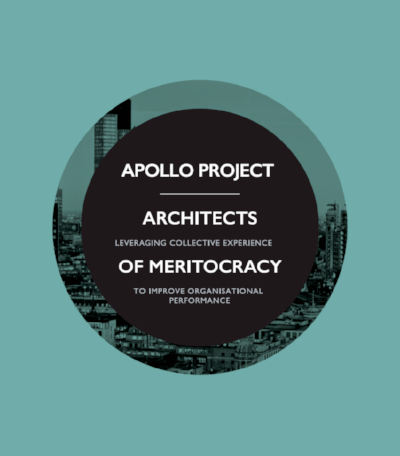 Individuals and organisations with winning initiatives receive an Apollo Project: Architects of Meritocracy award for their innovative work in instigating cultural change. Initiatives are judged by a panel based upon strict criteria.